Finding the perfect ski holiday accommodation just got easier! Whether you are looking for a self catering apartment or a catered chalet, we will help you find the perfect place to stay. Use the quick search on the left to tell us what you are looking for. Matching accommodation results will be displayed and their location plotted on an interactive map. As well as fully descriptive accommodation features, facilities, rates and availability, we’ve gone all-out to include high-resolution photography, video tours and Google Street View, so that you can get a feel for the accommodation. Accommodation bookings are direct with the owner, so there’s absolutely no catch - no commission, no booking fee! We’ve made it easy for you to share your findings with others via email, Twitter, Facebook and many other social networking sites directly from the property pages. If you own or rent a ski property, we would love for you to join us. We're so confident that you will love what we do that we will let you advertise your property for FREE Forever...! Visit our 'Advertise your ski property' to fine out more. Mt. 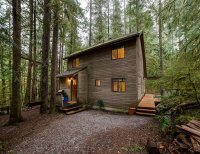 Baker Cabin #55 - HOT TUB, WOOD STOVE, BBQ, SLEEPS 10!